Availability: quite available on both sides of the Atlantic. If your grocery doesn’t have it, try Amazon. Rating: Clean and only slightly bitter, it adds just enough to make it a gin and tonic. The sweetness level works for us, but it could use a bit more quinine. But at half the calories of the also low-calorie Q-tonic it’s not a bad bet for those who are counting calories. But otherwise, there’s more flavorful, and also relatively low in calorie options out there. On the nose, evident effervescence with a distinct touch of lemon/citrus. The palate is greeted with the signature Fever Tree burst of fizz, but when it clears, there’s not much else there. There’s only a tinge of bitterness and maybe a slight citric note. It’s clean, and has a touch of bitterness, but it just doesn’t deliver much on its own. It’s not wildly different from the flavor of their club soda, which while delivering plenty of effervescence, it just lacks in flavor and character. For those who are counting the calories in their gin and tonics, it’s worth beginning with the gin. Gin comes in at about 100 (give or take) calories per jigger (1.5 oz. pour) of a 40 proof spirit. Like a stronger gin? Then make that about 115 calories for that same 1.5 oz pour. Having two shots in your G&T? Well let’s call that a cool 230 from the starting point. Ready to add tonic? Ready to add a light tonic? Fortunately, there are plenty of tonic waters out there which eschew sweetness without cutting flavor. Quinine, the primary flavor character, adds nearly no calories to the drink. Which is why, in terms of judging tonics, that calories have little effect on how good (or not good) the final product is. Flavor can be added independent of the sweetness. While some will prefer a sweeter tonic, that’s fine. And some (like me) prefer a less sweet tonic. 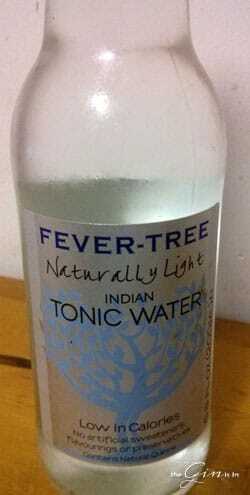 So perhaps that’s why I find Fever Tree’s Naturally Light Indian Tonic Water to be a little underwhelming. Simply because while it does manage to deliver on the low calorie count (and if you’re adding 2 oz of gin to this 7oz. of tonic, we’re up to 265 calories), it doesn’t deliver as much flavor. Let’s talk about just how many calories you’re saving. If you go with Fever Tree regular ([icon name=”star” class=””][icon name=”star” class=””][icon name=”star” class=””][icon name=”star” class=””][icon name=”star” class=””]) you only save 45 calories. Rather than having a 300 calorie drink, you’re having a 265 calorie drink? Still see, worth skimping on the tonic? And if you’re looking for something equally low in calories but with more bitterness, Q Tonic ([icon name=”star” class=””][icon name=”star” class=””][icon name=”star” class=””][icon name=”star” class=””]) delivers. People are often looking to cut carbs, not calories. It’s the carbs, not the calories.